Coordinating a family’s daily activities can be minefield. From school to sports to general appointments, free time can be difficult to find. When you add in carpools and travel, the calendar could become a logistic nightmare. For some families, a visual representation of the to-do, where to go, and who’s in charge can be helpful. The magnetic glass board from Balt can make your family’s check list a little easier. 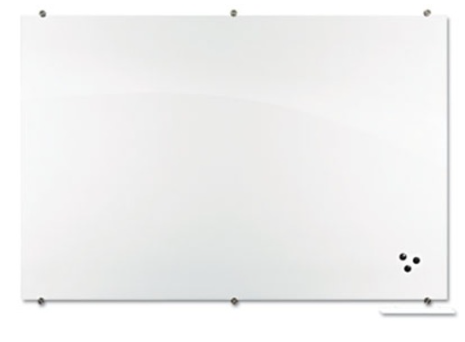 The magnetic glass board by Balt works for a family to-do list, schedule or calendar. Placed in a kitchen, office or even the mudroom, the sleek, smart design can blend in a variety of locales and decors. Compatible with dry/wet-erase markers, the board can handle the multitude of changes, do-overs and even doodles. The surface can be easily cleaned and doesn’t have staining. Unlike other wipe calendars, this board can be customized to a family’s need. From a side note of a grocery list to special reminders for field trips, the board conforms to the family’s needs. Without staining or “ghosting” (the left over marks that never seem to be erased), the past items are gone without a trace. An added feature for families is the magnetic aspect of the whiteboard. Kids have an endless supply of forms, tickets, and other important papers. In our house, a centralized paper holding spot is a requirement. A magnetic clip on the family’s schedule board keeps everything organized. No more searching for lost papers and wasting time. One location holds it all. This magnetic glass board can be purchased on shoplet.com for $86.69. This use of a magnetic glass board is a great way for officesupplies to be used in a family setting. The sleek, simple design can blend with any décor. Get organized and be prepared for whatever your family has planned next. Disclosure: The reviewer was provided with this product for purposes of this post. All opinions are her own.